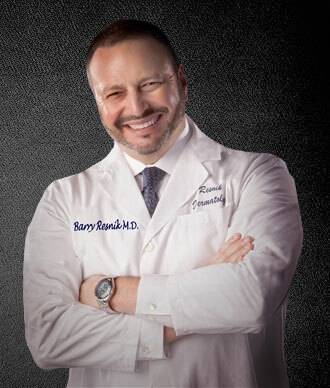 Barry I. Resnik, MD is the Medical Director of the Resnik Skin Institute and HS Authority in Aventura, Florida. He graduated from Tulane University School of Medicine in 1990 and completed his residency in Dermatology and Cutaneous Surgery at the University of Miami School of Medicine in 1994. Dr. Resnik is a Diplomate of the American Board of Dermatology and a Fellow of both the American Academy of Dermatology and American Society of Dermatologic Surgery. His specialization in treating HS came after he realized patients were not being offered the full scope of therapies for this orphan disease. Each patient fills out a Therapy Survey before their evaluation, allowing for a customized treatment plan, without duplication of therapy. Long-term anti-inflammation therapy using antibiotics, hormone suppression therapy using spironolactone, oral contraceptives and dutasteride. Biologic therapy featuring Humira, the first medicine labeled by the FDA for the treatment of HS, is a mainstay of therapy. Dr Resnik was part of the Advisory Committee whose recommendations and work lead to the FDA decision. He also offers the off-label use of Remicade, Cosentyx, and others. Dr Resnik is a pioneer in the surgical treatment of HS. He offers staged CO2 Laser Marsupialization surgery with second intention healing. This revolutionary surgical technique removes just the skin bearing the “ant-farms”, the thick, scarred plaques of long-standing HS. The healing process is relatively easy, gives a cosmetically acceptable scar, and offers a very low recurrence rate. HS affects more than just the skin. Nutritional therapy, including Mediator Release testing, is offered, as dairy and other foods can exacerbate HS. The mental effects of HS are addressed as well. The psychosocial impact of HS cannot be underestimated. Intimacy therapy and counseling are also offered. HS is an all-encompassing disease and demands an all-encompassing approach. Resnik Skin Institute and the HS Authority are here to provide that care and attention.